and I end up with a mess in my oven. I would love to see a video of how to properly transfer. Thank you. I love this book!! Or, you can use parchment paper under the loaf, which makes it super easy to get into the oven and no cornmeal to clean up. I do not agree. Read: [website omitted here]. So sorry, but we can’t allow websites we can’t vouch for to be published to our site, so I had to omit. Can you re-phrase in your own words? So confused..In book © 2015 recipe calls for 1/4 Tsp yeast, Gold Metal bag 1 pkg = 2 1/4 Tsp. Printed copy of recipe from author on internet uses 1TBLS. What the stink…How is one to make this bread? We don’t have any books that are copyright 2015, can you check that again and tell me what page that 1/4-teaspoon quantity appears? Could I also use a preheated cast iron dutch oven without the lid instead of a stone to bake the bread in the oven? If this is possible, what size of a dutch oven should I use then? Sure, you can bake it in a Dutch oven, with or without the lid. You’ll want to use parchment under the loaf, so you can get the bread out of the pot when it is done. The size of the Dutch oven depends on how large a loaf you are going to make. I typically use a 5 quart for a 1-pound loaf. But now I am a little bit confused about using the lid or not…. If I use the lid then probably I don’t need to add a cup of hot water to the broiler tray, right? What are the suggested baking times for both ways ( with and without the lid)? If you don’t use the lid, you’ll need to add steam to the oven and the baking time will be about the same as if you are baking on a stone. Sounds like your pan’s a little larger than the skimpy 1-pound pans–just use more, in a loaf pan, fill it to 3/4 full and you’ll be happy (may take longer to bake). Can this bread be rolled out and used as pizza dough? Yes, it sure can. I prefer the dough with some olive oil, but use this one as well! No, you want it to be dry at the end, otherwise the crust will never crisp up. I am excited to try your method Zoe. I have been following you for a while on Instagram and love the things you bake. Thank you for sharing your talent and good taste! Hi! I’ve baked single recipe bread using your recipe a couple of times and it has always turned out well. do you have your recipe with ingredients listed by weight and not volume? I want to try making bread in batches. Thank you. Yes, that is one of the big changes we made in the new edition of the book, all the recipes are now done in weights and measures. Hi Zoe and thank you! 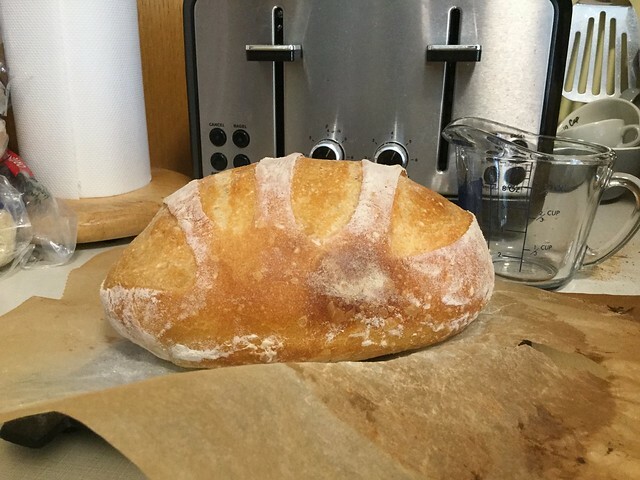 I encountered a problem with my breadmaking and wonder if you could help me. Ive been baking bread but the last time, after keeping the dough in the ref for 3 days, I noticed a strong “alcohol” aroma, and it didnt rise quite as much as my other batches. Also, there was liquid at the bottom. I think this is what they call “weeping”. I don’t understand what went wrong since it’s the same recipe I’ve been using. Do you know what probably caused it? Many people feel there’s an alcohol smell with aged dough, but it boils off with the baking. As for the weeping– just pick up your dough with floured hands and you’ll absorb it–use enough. It won’t harm the bread. I have used this dough a few times for baking projects with preschoolers and it’s great! We’ve used toaster ovens and slow cookers and had great success with both. I have access only to a convection oven here in S Korea so wondering about baking temps/time conversions. Also wondering if you have tips for getting it to a more “sourdough flavor. 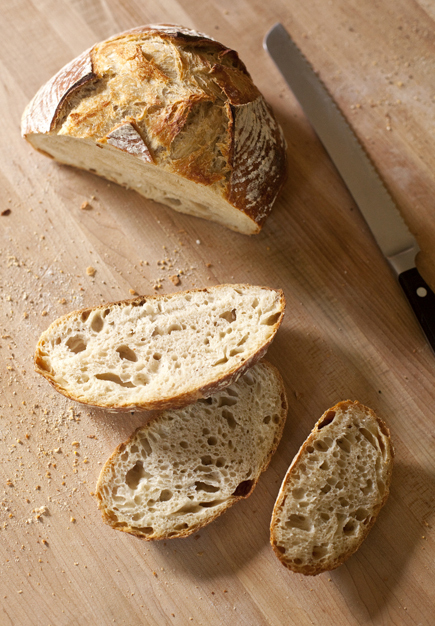 Im using the recipe in this post, the 5-min artisan bread, no knead. I’ve made only twice and am a novice, so that could explain my issues! My dough is soft and gooey and shapeless. I can’t make slashes in it. Does this mean it’s overproofed? I tried some pretty sharp knives, but maybe it’s my technique. It definitely doesn’t resemble your almost-ready-for-oven loaf. I let rise for 4 hrs (only 1/2 tbsp yeast), then in fridge for 30 min. Then I pulled off a 1 lb piece and shaped it although it was really sticky and loose. Then let rise for another 60 min. It didn’t change shape much, but did expand some. Thanks! If you let it rise for 4 hours, then only refrigerated it for 30 minutes and let it rise again after shaping, for 60 minutes, it is very likely over proofed. We recommend you refrigerate it for several hours before shaping and then let it rest 60 minutes. If you use the dough fresh, without refrigerating (or only 30 minutes), then you only have to let it rest about 30 minutes before slashing. Thanks so much! I’m going to keep practicing. There is something so satisfying about baking bread. And the flavor in this bread is delicious, regardless of my errors. hi is there any metric measurement for your recipe? Which book are you using? They all have metric measurements. The very first book didn’t but it is no longer in print. Hi, I tried 5-6 t8mes the basic recipe with spelt flour and it didn’t work… I read all the book, the troubleshooting section, but I can’t solve my problem. When I form the bred, it doesn’t hold the shape. So I get a flat bread instead… I tried to add more flour, but it always does the same thing. Can you help, please? I would really love to try all the recipe in the book, but can’t have success with the basic one. Thank you! We have multiple books, each with its own basic recipe. Which of our books are you working from, what recipe and page number? Oh my goodness! 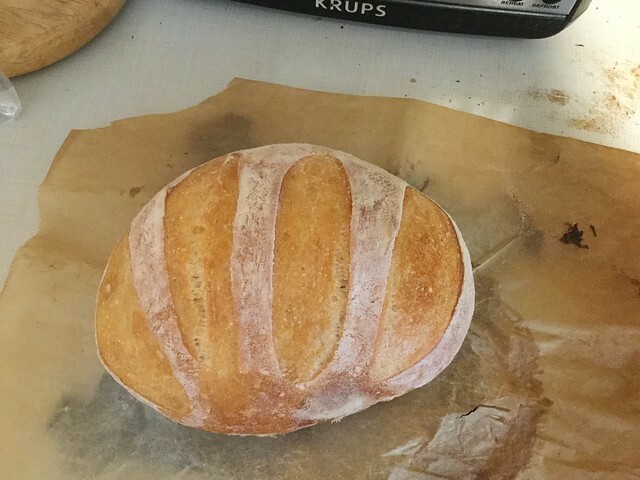 I made the master recipe in this post yesterday and baked my first loaf, boule? today. Thank you ! I made substitutions as needed since I didn’t have the exact supplies. Scooped and swept 6.5 cups all purpose flour, then weighed it – over 2lbs so I took out 1/2 cup to get it to 2lbs. I trust my scale, it’s been accurate every time we’ve tested it. Next time I’ll use the full amount and see how it goes. Rested 2 hours then refrigerated overnight. Pulled out 1lb – nice stretch, really, really sticky ! I fought with it to make a ball, unsuccessfully, but sat it on parchment for the 40 min. In the meantime I looked up and found the video for shaping wet balls and went back and reshaped it adding more flour til it was not sticky. Then rested for a full 40 min. Cooled for 2 hours before cutting. I’m pretty sure it is ok. There is a crispy crust, holes in the middle, but it’s a nice light inside rather than the chewy I was expecting. Is that right ? I’m going to make the next 3 loaves a few days apart over the 2 weeks to see how the flavour develops. Your bread looks just about perfect to me. I wouldn’t change a thing! Thanks for the photos, so great to see what you are baking! Can this loaf be made in a 9×5 loaf pan? Any changes to the recipe? Looking forward to making this! I have some wonderful bread recipes, is there a way to convert them using your incredible method ? No easy way–it took lots of testing in our books. If you learn the method well from our recipes, you should be able to convert your recipes. I’d love to try this. I don’t have a large container with a lid to store the dough in for several weeks. Is it OK to just use a ceramic bowl and cover it with cling film? Just wondering if I really NEED the container. I have always been confused when you call for “6 1/2 cups (2-pounds) all-purpose flour.” Is that for the everyday bleached all-purpose flour or for the unbleached all-purpose flour? Or does it make much of a difference, especially with the water amount? We always use unbleached all-purpose flour in our recipes. You sure could substitute bleached, but we just prefer the flavor of unbleached. I am intrigued by your blog and your breads. I have difficulty eating breads with a tough crust. Is there a way to soften the crust? Hi. You can soften the crust by draping a clean kitchen towel over the loaf as it cools. Traps the steam in the bread and softens the crust. You can also brush it with butter when it comes out of the oven. I think I’d rather knead. There are WAY TOO MANY steps. I thought this was a “no knead crock pot loaf of bread”. What happened to the crock pot? just wondering if you have a version of the master recipe where the yeast and salt measurements are in grams (I’m trying to be as accurate as possible). I bought your Craftsy videos but they don’t seem to have these conversions. Also I have just purchased an Emile Henry loaf baker. I see that you have done a recipe for a raisin walnut bread – have you done one in this loaf baker, using your master recipe. Just wondering whether I should use the same measurements/temperatures that you have used – ie 2 lb of master recipe dough as well as paint the top with water before putting in oven. I would appreciate any advice that you could give. — no water/steam needed, it “steams” itself, but uncover for the last third of the baking time. One further question if you don’t mind – I am assuming that all your recipe measurements are in US. I assume that because I live in Australia, I’ll need to convert the US tablespoon quantities to that of Australia. I bought your book and love the master recipe process using a bucket. one question, when the dough starts to run low, I understand you can replenish and refill to keep the bucket full and always have dough to bake bread. I didn’t see how to do this? do you just make another fresh batch same as before? do we keep some of the existing bread and mix it in for a sourdough effect? See the instructions on page 62–that’s all you’ll need! Thanks for the really quick reply. oops, I must have missed that page, yep, there it is page 62. Thanks again. …the typo in your Red Star affiliate notification is killing me. Where are crock pot instructions? Hi. LOVE your books and amazing recipes. I always have a batch of dough in my refrig. 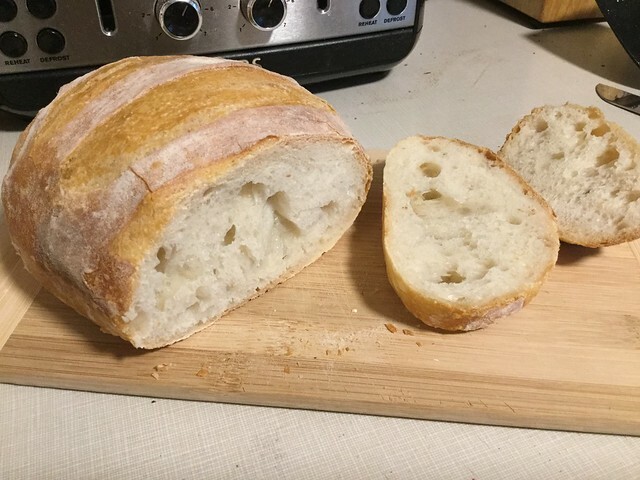 I’m not sure if this has been discussed to this point, but I just want to share with you that using 3 cups of leftover liquid whey from making homemade yogurt, brings the master recipe loaf to a new level. It’s amazing! I am constantly trying to find new ways of using the leftover whey and this was a great solution. Also…I receive so many compliments on my bread and it’s all because of your recipes. I recently made a muffaletta sandwich with your master recipe loaf…yum! Thanks again! This is so exciting, thank you for the note. I have made the dough with whey and love it. I am so thrilled you are enjoying the bread! If we are using a 6 quart bowl and not the lidded bread bucket should we cover our bowl while rising? What about once it’s refrigerated? Thanks! Yes, just cover it with something that isn’t airtight, and not cloth. Hello, I’ve tried this recipe four or five times now. My problem is that I can’t get the dough wet with the 3 cups of water. I stir the mixture three times and already it is too dry! I can’t even incorporate all of the flour into the dough because it’s already super dry. I have to add at least another half cup of water to get it wet as it should be and have a homogeneous dough. Is that normal to happen every time? My water has 110 degree F.
1. Are you making any changes in the ingredients, especially with regard to the type of flour? If you swap in whole wheat flour, bread flour, or Canadian all-purpose flour, you need to adjust the water. See http://amzn.to/17Rw23Y for details (note that our publisher will disown us if we put all our detailed content here on our website!). 2. If you aren’t weighing your ingredients, are you measuring the flour exactly as we do? See my video on that, at http://www.artisanbreadinfive.com/2010/04/28/how-we-measure-our-flour-using-the-scoop-and-sweep-method. I use KA unbleached all purpose and weigh the dry ingredients in grams with my kitchen scale. The bread comes out nicely and has a good flavor. I’m just baffled that I need much more water. I also have to add water during the 2 weeks in the fridge, the dough seems to dry out fast. Anyway thanks for the great recipe! We have a link in the online recipe with how to adjust the water for KA unbleached, and what I can’t understand is why you need so much more than even that (though we’re in the ballpark here). Maybe KAF has boosted their protein content even more than when we tested and compared. If the recipe’s working for you–all good, I suppose. Thanks for the info on the different flour types. It makes sense now that I need more water. Just surprised HOW much more. Perhaps Tina lives in a super-dry climate? I was wondering about that also. It’s winter and the house is heated thus the air is dry. But others would have the same problem in winter right? I will see if something changes comes spring. I was thinking about the climate outside the house. If you live in a naturally dry climate the flour would probably start drying out during shipping, at the storage facility, and at the store even before it got to your kitchen. I haven’t even thought of that. But no dry climate in Northern Michigan unfortunately. I need to make 120 rolls for my daughter-in-laws wedding reception & I was wondering how many rolls a 6.5 batch of dough makes. What a great contribution to the wedding! How many rolls will depend on the size you make. It looks like you are making the Master Recipe, which makes 3 pounds 12 ounces (1700g) of dough, so you can just divide that by the size of the buns you want. I have been using your recipe with different cookers, brands of flour, overns… All fine but each time ends up wet and sometimes a bit sticky texture inside the bread. What is possible reason for this? Which recipe do you mean (from which of our books, what recipe and page number)? Hi Jeff, I accidentally left the begging mixture to sit out of the refrigerator overnight. Can I still bake with this, or will the outcome be undesirable? I am interested in buying your book; however, before doing so, I would like to know if the weights are in the metric system (Kilos and liters) seeing as i am not familiar with pounds, quarts and so on. We started writing our books in 2007; the 1st two books didn’t have metric. But all our subsequent books did. Which one are you interested in? Then I can point you definitely. I am interested in “The New Artisan Bread in Five Minutes a Day” edition. l like to use metric scales when trying new recipes and therefore, would like to buy the edition that the weights are given in metric form. They are–we have tables with US and metric in different columns. One thing though–we actually weigh our water (in grams) rather than giving the liter-equivalent. I also weigh in grams.